Reflections of a beginning urban sketcher......or what I wish someone had told me at the start of the year. As I write this I’m sat at a café in a small seaside town where my family live; I'm reflecting on my urban sketching adventures and thinking about what I would tell myself as I sat here last New Years Eve having not picked up a pencil in 15 years. Perhaps this might inspire someone else to pick up a pencil and draw his or her life. 1 – draw, draw, draw – the more you draw, the better you get. It’s all about practise not making it perfect. 2 - Draw the everyday things around you, the coffee cup, the cake, the pens you use, and the shoes on your feet. 3 – Don’t rub out those mistakes, learn from them and live with them. Often when I thought I had done a lousy drawing, I looked again, a while later and could appreciate it much more. 4 – Don’t get sucked into thinking you have to have the right materials to draw – use what you have, if you don’t like it what you have then ask for advice from others, borrow stuff and try it out and if you don’t like something – perhaps, find it a new owner or home. 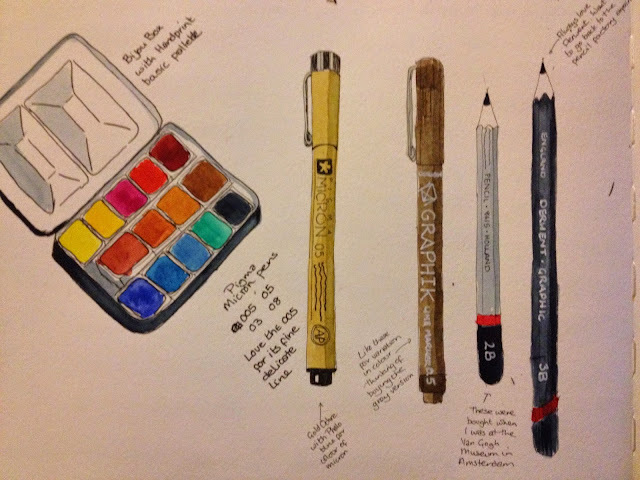 Don’t think that having the most expensive stuff is the key – three pencils, a waterbrush and a pen were used in my favourite sketch of the year. 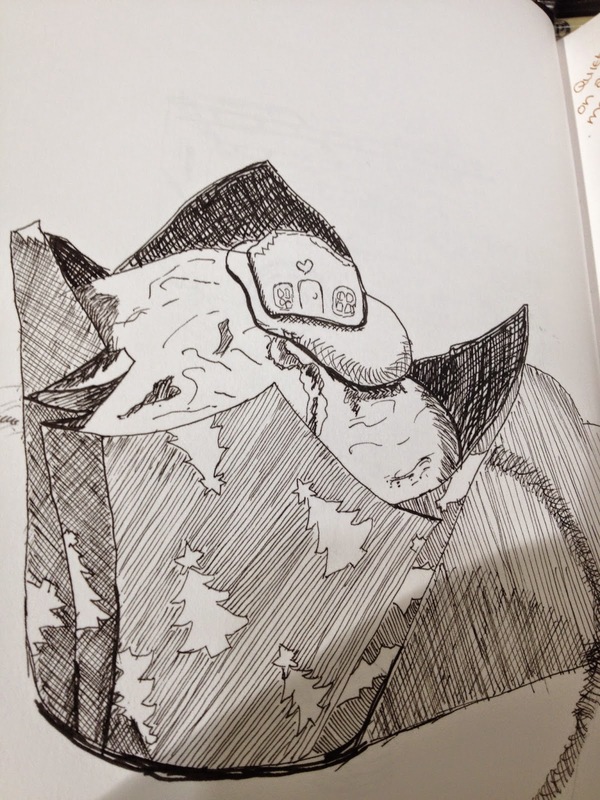 5 – Try not to work across too many sketchbooks – taking them all out makes your bag very heavy. 7 – Your sketchbooks are precious –but not so precious you are scared to make mistakes or not use them. 8 – Ask for advice and feedback from others, it can be a little nugget of advice that can move you forward. One of the best I received was two words about drawing people ‘draw bigger’. Thank you, Lynne. by Lynne Chapman - Afraid of Colour? noticed and what you thought went well. 10 – Carry a sketchbook and a pencil or pen… always. 11 – Draw often, short but everyday is better than 4 hours once a month. If you think you don’t have time, turn the TV off and turn on your creativity. 12 – You don’t have to share your sketches until you are ready to. My early ones were not seen by anyone. 13 – Drawing ‘bits’ is less intimidating – a nose, ear, foot, window, door rather than a whole person or building. One of the many train tickets from this year. 15 – Review your sketching kit regularly otherwise you will take everything including the kitchen sink. Make each piece earn a place in your daily kit. Thanks Liz Steel. 17 – Simplify – you don’t have to draw everything, exactly as it is.. embrace wonkiness. See the stained glass window in this painting. 18 – Eventually you find some materials and a style, enjoy them but carry on developing, experimenting and learning. 20 - Seek out and share inspiration with others, follow them on facebook, twitter, pintrest, flickr, post your sketches online, join an online class, watch a you tube video… look for those nuggets to help you move on. 21 - Don’t give up, when you look back you will be able to see progress. With thanks to all the Urban Sketchers who I have met, followed and/or drawn with from across the world. Particular thanks to Lynne Chapman, Simone Ridyard, Mike Dodds, Adelina Adelydee, Ann Marie Percival, Andrea Joseph, Paul Heaston and Liz Steel.